Schroeder unfurls eight stellar scams—perpetrated from the Philippines to your Phillips radio—that shook the gullible for all they were worth. As long as you are not on the receiving end, scams are enormously entertaining. Here readers learn of the Tasaday deception, the 18th-century Shakespeare fraud (with its sad father-son conflict), Orson Welles’ radio hysteria (said Orson: “Every true artist must, in his own way, be a magician, a charlatan”), along with plenty of plain old swindles serving as cautionary tales that we may never learn from, as greed, need and desperation always have the upper hand. 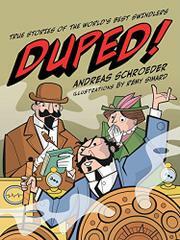 What makes Schroeder’s presentation of these bamboozlements so pleasurable—other than the gotcha! factor—is the clarity of his narrative, the unhurried exploration of the dupe and the fact that the only things that get hurt here are egos and pocketbooks. He has also chosen the fleecings for their color—of the P.T. Barnum sort—rather than the darker work of Enron or no-bid military contracts. Simard’s accompanying artwork lays out in grayscale the raw bones of the flimflams, driving home the salient moments when the ruse worked and then when things went south.